Three Gorges Dam is the largest hydraulic project in the world. After its establishment, it has formed a 600km long reservoir. Get a close look at the dam and you'll definitely be impressed by its majesty which truly shows the indomitable spirit of human. Located in Sandouping (三斗坪), Yichang City, Hubei Province, 38km from Gezhouba Water Control Project at the downstream, Three Gorges Dam is the main work of Three Gorges Project, which is the largest hydropower project in the world. Three Gorges Dam is 2,308m in length and 185m in height, and the project started from December 14th, 1994, and it's completed and fully functional as of July 4th, 2012 (except for a ship lift, which was completed in December 2015). After its building, the total electric generating capacity of the dam is 22,550 MW. The scenic area of Three Gorges Dam covers an area of 15.28km2. Taking the dam itself as the main attraction, the scenic area now has three parts open to the public: Tanziling Ridge, 185 Platform and the Commemorating Park of the Interception. The scenic area fully shows the culture of the hydropower project, and it also provides a multi-functional experience which combines tourism, education, leisure and entertainment into one, and also makes a perfect combination of modern engineering, natural scenery and human landscape. After arriving at the Tourist Reception Center, tourists can take the sightseeing bus in the scenic area to get to the three opening attractions. Each of them has its own perspective to see Three Gorges Dam: Tangziling Ridge can overlook the dam; 185 Platform has the eyelevel view of the dam; while the Commemorating Park can look up to the dam. Once entering the scenic area, the first attraction you'll meet is Tangziling Ridge (坛子岭), which is the earliest developed attraction. It was opened since 1997, and due to the observation platform is like an upside-down jar, so it's named as Tanziling (Tanzi means jar in Chinese). With an altitude of 262.48m, Tangziling Ridge is the best place to observe Three Gorges Dam. Tourists can not only watch the magnificent dam, but also see the Three Gorges Dam Ship Locks – the five-level Ship Locks is the largest ship locks in the world. Tanziling Ridge can be divided into three layers (connected by elevators) according to height from top to the bottom. Main attractions in Tangziling Ridge are Exhibition Hall, Observation Platform, Headstone of Three Gorges, etc. 185 Platform (185观景台) is located at the left side next to the dam crest of Three Gorges Dam. It's located at the same height of Three Gorges Dam, with an altitude of 185m, thus it's named 185 Platform. In here, tourists can see the water level of the upstream of Yangtze River, the entrance for the ship locks and the main architectures of the dam. Standing on the 185 Platform and look over, it's just like standing on the crest of the dam. Among the three attractions, only the Commemorating Park (截流纪念园) is located at the south bank of Yangtze River. There is the downstream of Yangtze River, and tourists can look up to the Three Gorges Dam. In the Commemorating Park, there is an exhibition hall, where you can learn more detailed information of Three Gorges Dam Project. Besides, tourists can also see artificial hill made of interception stones and exhibitions of the large-scale construction machinery. Since it's located downstream, thus, there is the great place to take photo with the panoramic view of Three Gorges Dam. The five-stage Three Gorges Dam ship locks is the world larges ship lock at present, with an overall length of 6.4km, and the water level difference of it reaches to 113m, which means ships need to climb up and down 40 floor's height when they passing the ship locks. This has been selected as the world record. Travellers taking either upstream of downstream Yangtze River cruises can enjoy shipping through the five stage ship locks to see its working theory and marvel at the wisdom of human beings. Since the whole shipping would take about 3.5 hours, you could take your time to see the ship passing through from one stage to next. Moreover, when you visit the Tanziling Ridge, you can have a full view of that “World MOST” project. The Three Gorges Dam Ship Lift was opened on 18th September in 2016. From then on, that is the world-class great ship elevator with the most complicated techniques and larges scales. Besides, that is the final construction item of the Three Gorges project. Ships now need only about 40 minutes now to pass the dam by the ship lift, compared to passing the ship locks, which makes great contribution for the efficiency of ships passing through the Three Gorges Dam. The ship lift is about 5,000 meters long in total, maximum elevation height is 113, and it can hold ships of 3,000 tons to pass the dam, so at present, only part of Yangtze River cruise ships of smaller weight can take the elevator at the dam. And in 2017, Victoria cruises is the only Yangtze River cruise company that provides the experience of the ship lift for free for travellers. Therefore, if you are very interested in this world advanced and complicated elevator at the Three Gorges Dam, you could book your ideal Victoria cruise ships from us. Recent news: the Three Gorges Dam ship lift would not be operating from July 20, 2017 to the reopen date of the lift (around middle October 2017) due to its adjustments and improvements, therefore, Victoria cruises are not allowed to sail by the ship lift during that period. From then on, itineraries will have some changes and you can ask our Travel Consultant for details. Three Gorges Dam Project has brought great benefits to China since its establishment. Generation Function: Three Gorges Dam is the largest hydroelectric power station in the world. With 34 generators, the expected annual electricity generation will be over 100 TWh. Due to this generation capacity, the Three Gorges Dam greatly relieve the electricity tense in the downstream of Yangtze River, like Shanghai and Hubei. Flood Control Benefit: when the reservoir of Three Gorges Dam operates, the reserved flood control capacity is 22.15bn cubic meters, and the peak discharge of flood can reach to 27,000 ~ 33,000 m3/s. Three Gorges Dam has improved the flood control ability of China greatly. Navigation Benefit: from Chongqing City to Three Gorges reservoir, the project will improve 660km shipping route. Annual one-way navigation ability has improved from 10 million tons to 50 million tons. Drought Resistance Ability: if the downstream of the river encounters drought, then the dam can draw off more water to relieve the drought. Three Gorges Dam is located in Sandouping Town, Yichang City, which is about 40km from the city center. Ship: Tourists taking the cruise ship don't need to worry about the transportation, for the ship will pass the Three Gorges Dam and you'll have time to make a shore excursion to it. Bus: For other travelers, you can take the travel bus at Yichang Tourist Center. There are only two buses a day, and they depart at 8:00 and 13:00 ~ 14:00. In Yichang city center, tourists can also take public bus (No.4, 100, 101, 10) and get off at "Yemingzhu" stop, then transfer to bus No.8 and get off at "Zhanlanguan" stop, then walk about 5 minutes to get to the tourist center of Three Gorges Dam. Self-drive: If you drive from Yichang city, it would take about 1 hour and 15 minutes for about 45 kilometers. After arriving at the tourist center of the scenic area, tourists can take sightseeing bus to tour the whole scenic area. The sightseeing bus has two routes: A route (¥35/person) and B route (¥18/person). The sightseeing bus will transfer among Tangziling Ridge, 185 Platform and Commemorating Park (B route doesn't include the Commemorating Park), and it will depart every 20 minutes. 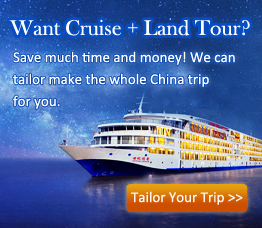 For those who take a Yangtze River cruise ship, the cruise company has arranged comfortable rooms for your stay. While for others, since half day will be enough to visit Three Gorges Dam, if tourists want to spend more time in Yichang, it's suggested to stay overnight near the city center. You can find various hotels in Yichang, from starred hotels to mansion style hotels, or home inns. The price for normal starred hotels is from ¥200 to ¥300, and most of them are located in the city center. Of course you can find quite good hotels near the scenic area, however, the price is more expensive. Spring and autumn are the most comfortable seasons, warm and fresh, and sunshine is also abundant during these periods. However, as for the best time for visiting the Three Gorges Dam, June to July may be the best time in a year. Summer is the rainy season, and the rainfall is abundant during this time, so tourists may see the famous scenery of Three Gorges Dam – flood discharge scenery. Although the flood discharge time is not predictable, tourists have a great chance to see the scenery in rainy season. In summer, it's very hot in midday time, so if you visit at this time, then use sunblock, hat, sunglasses and even UV umbrella to protect yourself from the sun burns. At the meantime, remember to drink water for water replenishment. Besides, since there would be a few stairs to climb in the dam tourist area, it is suggested to bring your comfortable and light shoes so not to make your feet that tired. Top 3 Three Gorges tours chosen by most customers to explore Three Gorges in the best way. Check the detailed itinerary, or tailor your own trip now with us.